Donald Morel (left), West's chairman and CEO, shakes hands with An Taoiseach Enda Kenny, the prime minister of Ireland, after the announcement was made recently that the company will build a plant in Waterford, Ireland. 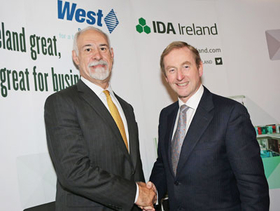 EXTON, Pa.—West Pharmaceutical Services Inc. is doubling its stake in Ireland and expanding its global reach in the process. It plans to construct a plant in Waterford, Ireland, to produce proprietary elastomeric sheeting used for packaging. The project is one of two West expansions going on in the country. The other involves the company's manufacturing and product development center in Dublin, operated by West's Tech Group Europe, which serves the medical and pharmaceutical industries. Construction of the planned Waterford production facility, which will be located on a 44-acre parcel, likely will begin in early 2015 after the company receives planning and zoning approvals. The firm expects to receive approval in the latter part of 2014. Cost of the project is projected to be in the range of $125 million. The Irish Development Agency has been assisting West in the process to create the new plant, but the company and agency did not say if financial assistance from the IDA was involved. Detailed plans for the new plant in Waterford have not been finalized, according to a spokeswoman, so it's unclear yet how big the site will be. Once operational, the plant's initial work force could number approximately 150, West said, and it is expected to grow from there. With additional expansions, expected to be done in phases, the facility could accommodate a work force of between 250 and 300, the company said. West's phased plan calls for an expansion or expansions creating additional manufacturing space to handle multiple lines, the spokeswoman said. More manufacturing space likely would be used principally for the firm's proprietary injectable component product lines, which are integral to many injectable and dosage forms, she said. An investment as large as $125 million “demonstrates our commitment to establishing a robust operation (in Ireland) to support customer demand,” the spokeswoman said. “With diabetes emerging as one of the fastest growing diseases globally, our pharmaceutical customers are expanding their production lines for injectable insulin,” said Donald E. Morel Jr., chairman and CEO of the Exton-headquartered company. The expansion, he added, will help the firm address the need and continue to serve those individuals. West's elastomeric sheeting is used to package insulin for use in pen injectors. In the future, he said, the facility will be a center of excellence for advanced packaging components needed by customers for a range of sophisticated injectable therapies. A look at West Pharmaceutical Services' existing manufacturing plant in Dublin. In a separate project, West's Dublin plant operated by subsidiary Tech Group Europe, which employs about 230, is undergoing a 12,000-sq.-ft. expansion as a result of securing a significant contract from a leading global pharmaceutical company. Tech Group Europe is part of the Tech Group, a subsidiary of West. The contract it received calls for the manufacture, assembly and decoration of a complex injectable device for the diabetes market that will go into full scale production in 2015. The device will be shipped to the customer's European facility for final assembly. Completion of the expansion is expected in the first quarter of 2015, the spokeswoman said, with production commencing late in the third quarter. 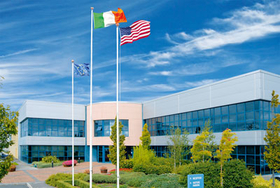 Tech Group's Dublin plant serves as the European headquarters for the group, which specializes in providing device design, development and manufacturing for pharmaceutical and med-tech customers. The facility was established in Ireland in 1998 and became part of West in 2005 when the firm acquired the operation. “This expansion reinforces the commitment to developing the Dublin capability as part of an ongoing long-term investment plan,” according to Dan O'Callaghan, vice president and general manager of Tech Group Europe. West also manufactures components for insulin pens and glucose monitoring systems at its facilities in Arizona. It makes plungers and lined seals for insulin pen cartridges at its plants in the U.S., Germany and Denmark. Established in 1923, West operates numerous sales, manufacturing, customer support, and research and development facilities in North and South America, Europe, Asia, and Australia. It had 2013 sales of about $1.4 billion. In July, the company completed construction of its first products manufacturing facility in Sri City, India, and said at the time that it had plans to expand production at the factory. The 164,700-sq.-ft plant sits on a site that covers 783,600 square feet. It expects to employ approximately 45 at the site by the end of 2015. The highly automated Sri City facility makes elastomeric packaging for injectable medicines.